Eleanor McCullen is a living saint. Her commitment to the sanctity of human life is responsible for over 100 children being able to breathe the same air we do daily. Eleanor is the lead plaintiff in the case argued before the U.S. Supreme Court on Jan. 15, 2014. The defendant, Attorney General Martha Coakley, is best-known for her ill-fated attempt in 2010 to win the U.S. Senate seat, vacated by the death of Edward M. Kennedy. A compliant media has underplayed her lack of AG oversight regarding the devious activities of the Tsarnaev family. There are also multiple unanswered ethical and legal questions in the "transfer of assets" of the 6-hospital Boston Roman Catholic Healthcare System to NY-based Cerberus Mgmt. LLP, the venture capital giant. Coakley's current political venture has her listed as the favorite to be the Democrat's candidate for Governor this coming November. These two women could not be more different in personality and commitment to ideals. Underlying McCullen v Coakley is a classic morality play involving the forces of good and evil – literally Life and Death. The Life side of the equation is very much in evidence when Eleanor is viewed with a mother and her child – and at least in one instance, twins – who had come to visit her. 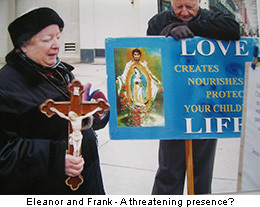 With knitted baby caps, fresh roses, and rosary beads she is hardly a threat, as characterized by the Attorney General and the abortion provider community. She is a mother, grandmother and God-mother in its real sense. Conversely, watching the tight-lipped Martha Coakley outside the Supreme Court using her stilted language to talk abut preserving "privacy" and "reproductive health care" provides us with a stark contrast. While the issue is about "free speech," the subject of the speech permeates the atmosphere. 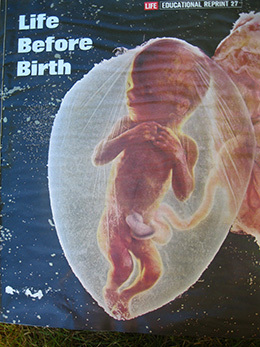 It's about saving developing human beings in the womb, so they can inhale and be nourished by the air in this atmosphere. Ostensibly, the legal issue is whether the 35-ft radius which sweeps much of the public sidewalk and part of a public street, violates the lst Amendment rights of opponents of abortion outside these premises. The distance between the client and those seeking to counsel against aborting the existence of the new human creation, changes the nature of any dialogue. It all but destroys the conversational and educational tone of any exchange. On its lst Amendment face, the case should be ruled in favor of McCullen et al, but, unfortunately, other facets are being highlighted in the public arena to tilt it in favor of the abortion providers. The mainstream media nationally has allowed the Boston Globe to frame the issues and create the narrative. Granting bellwether status to the Globe, they all have simply gotten in line. The Globe in the fall of 2013 started their narrative, embracing in shrill fashion the lexicon of the half-billion dollar abortion industry. At the center of this case is the de- parenting activities performed at 1055 Commonwealth Avenue, with the Planned Parenthood sign outside – a euphemism of the highest order. Marta Walz, as a leader in the state legislature co-authored the "buffer zone" bill, and it was signed into law in 2007 by Gov. Deval Patrick. Applicable parts of it are posted on the corner column of the building for the education of abortion opponents. No efforts are made to inform anyone else of the law's requirements. Walz in 2013, moved on from the legislature to accept the $250,000 position as President of the Planned Parenthood Federation of Massachusetts with an office in the building. This employment move was another example of the intertwining of the abortion industry, the State Ethics Commission, and the political power structure. Marta has been quoted often on the effectiveness of the "buffer zone" in thwarting the alleged "harassment," "threats" and "violence" to the clientele. This is where the media distortion initiated by the Globe's spin of the real story becomes evident. Marta Walz, co-author of this law, who ascended to the CEO of Massachusetts' largest abortion provider, states that "no anti-reproductive health care opponents" have been prosecuted under the law. The disconnect from reality goes beyond that, however. What is starkly ignored in the media coverage is that the profanities, insults and threats of violence are directed at the peaceful Right To Life counselors by those entering and leaving Planned Parenthood – not the reverse of this scenario.. Abortion-providers, such as Planned Parenthood, have been allowed to pre-empt the victim's role, although their admission of the lack of a single prosecution since the bill's passage in 2007 completely dispels this narrative. It is on this point, however, where the serious breach of journalistic ethics occurs. The Boston Globe, Associated Press, PBS, the Wall St. Journal and other news media in their coverage of this U.S. Supreme Court hearing inexcusably failed to report on this crucial aspect of the "buffer zone" issue. Harassment, insults and death threats are directed at abortion opponents and this was brought to media attention Although Assistant Attorney Gen. Jennifer Miller admitted to the Supreme Court of "swearing and screaming at pro-life advocates," the media have ignored the full story from the very beginning.. 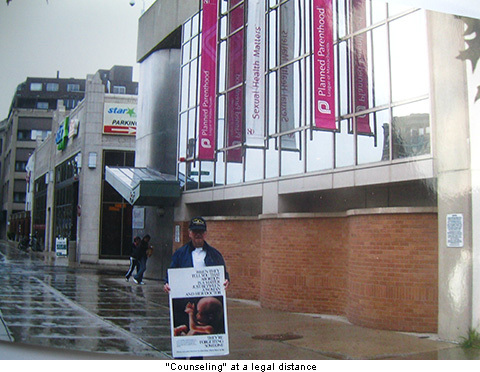 The public record of one such death threat perpetrated against a Right To Life supporter in front of Planned Parenthood on June 30, 2009 is available from Boston Municipal court in Brighton, where the case was heard on Oct. 9, 2009 (No. 09-1015). The Victim Impact Statement was made available to the media. The exclusion of this part of the "buffer zone" story by them is a serious abdication of journalistic integrity. The "buffer zone" and Planned Parenthood's building itself provided a safe haven for the perpetration of this death threat against a citizen exercising his lst Amendment rights, standing outside the yellow line of the zone. Had the Boston police not eventually flushed the perpetrator out of the building, no prosecution would ever have taken place. Planned Parenthood was totally uncooperative. 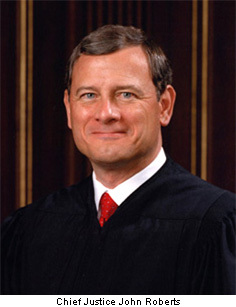 A major sub-plot, judicially and politically, centers on how Chief Justice John Roberts will vote on McCullen v Coakley. His lack of any questions or comments harkened court-watchers back to his swing vote which approved the constitutionality of The Affordable Health Care Act, Obamacare. Roberts engaged in fancy verbal gymnastics in determining whether a fee constituted a tax, or not. His credibility as a jurist, rather than as an individual who will compromise principle for politics, suffered enormously. The George W. Bush appointee's reputation as a strict constructionist deservedly took a severe blow. White House and Congressional pressure on him had been intense, using traditionalist's language such as "Judicial restraint" and requesting "deference to our duly-elected Legislature." The Chief Justice buckled in view of thinly-disguised threats as to the fall-out which would result from the political appearance of the vote, if Obamacare did not pass constitutional muster. As posted on the building, the first line of the 3rd paragraph of MSG 266, Section 120E grants exclusion from its penalties to "persons entering or leaving" the Planned Parenthood facility. In the instance cited, the perpetrator of the death threat to the pro- life counselor was given a special status by virtue of this wording in the "buffer zone" law. 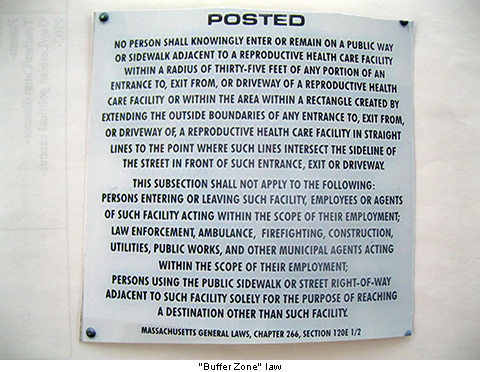 From its origins in the Massachusetts Legislature, as co-authored by current Planned Parenthood CEO Marta Waltz, the "buffer zone" law has been a sophomoric attempt to enshrine "a reproductive health care facility." Tripping over this "double- speak," the term had to be defined in the law. On its face, the vote should come down on the side of petitioners, Eleanor McCullen et al, and be declared unconstitutional by a clear majority of the Court. Martha Coakley already has her script. Whether the media will remove their self-imposed blinders, and how the Supreme Court Justices will vote are still open questions. What is not unresolved, however, is that truth is with the sidewalk counselors – and theirs will be the winning message in the end. Truth is indestructible – and eternal!